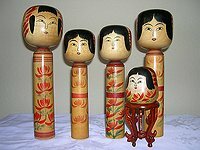 Naruko kokeshi are distinguished by their sharp shoulders and a head that, when turned, makes a squeaking sound. This is the only doll that does so. Some of the newer ones have rounded shoulders like the one on the left of the screen. 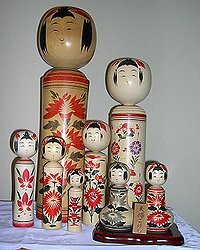 Kijiyama dolls are made from one piece of wood and have a very distinctive pattern of kimono and obi. 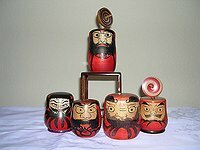 These are from the Zao- Shiroishi onsen (hot springs) and have the characteristic surprised eyes. Very cute. 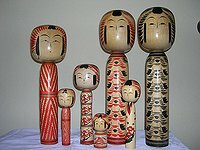 These dolls are characteristic of the Nambu area, lacking any design or painted color. 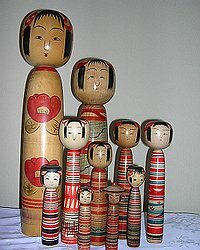 The largest one here has two rings around the base and the doll and rings were made all from one piece of wood. 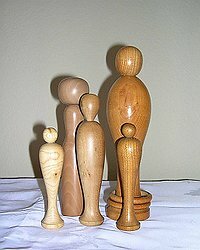 The head is often loose. 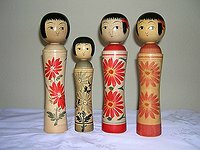 The dolls from Togatta are recognized by the very distinctive head design with the red petals along the sides of the heads. 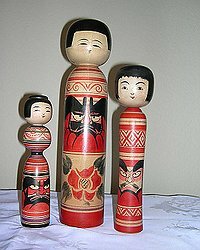 There are many different designs painted on the bodies ranging from diagonal red stripes, flowers kimono collars, and more. 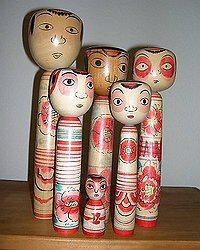 These very distinctive dolls have a very heavy hairline and “sanpaku” eyes (three line eyes). 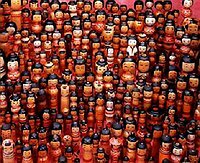 Made only by a handful of dollmakers they tend to be more expensive than most kokeshi dolls because there are so few makers of this style. 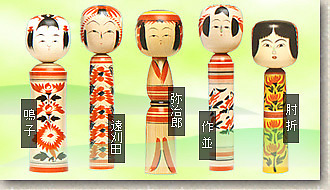 Yajiro dolls are easily recognizable by their signature waistline and colors. 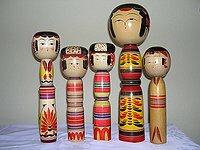 This doll has a dominant yellow base for its body with purple, black, blue and red designs. The various patterns range from stripes to flowers. 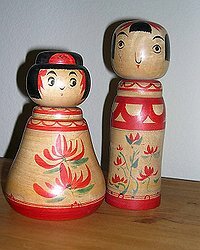 Some of these dolls also have a topknot hairdo. 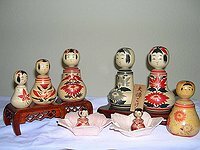 Naruko “sitting” dolls are called nemoriko dolls, indicated by the kimono spreading around the sitting person. 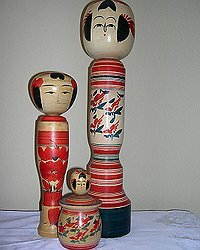 Other strains of kokeshi also have the nemoriko style. Don’t overlook these babies!!! 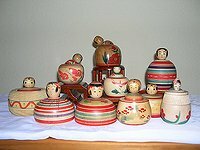 These are the babies in the “baskets” (EJIKO) and this is how the field workers took their babies to work with them, by placing them in baskets near them as they worked. 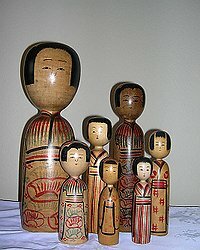 All the ten different types have these ejiko dolls. ylkawashima — Last modified Nov 29 2011 4:11 p.m.